Stargaze with the Twin Cities Illini Club at the Eagle Lake Observatory in Baylor Regional Park. Enjoy a tour and view the moons of Jupiter and distant galaxies through the site’s powerful telescopes. Kids welcome at this free event! 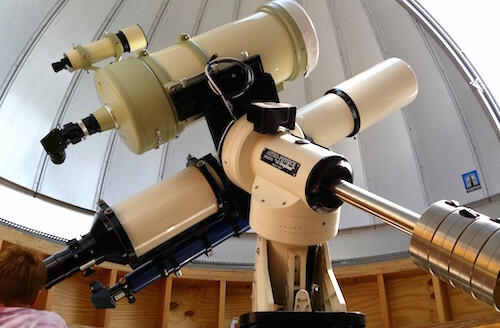 Join the Twin Cities Illini Club for a special night at the Eagle Lake Observatory in Baylor Regional Park on May 5, at 7 p.m. Our event hosts, the Minnesota Astronomical Society, will provide a tour and an introduction to the night skies and the observatory’s powerful instruments, including some of the most sophisticated telescope platforms in the state. The observatory is managed and operated by the society. Please RSVP in the column at right and let us know you are coming. After the presentation and tour, we will end the night with a telescopic tour of the night sky using the observatory’s very sensitive instruments. We will view the moons of Jupiter and its cloud bands through one o f the best planet telescopes available to amateur astronomers. The observatory’s large 16” and 20” telescopes will allow us to peer at many deep-sky objects, including stellar nurseries, reflection nebulae, star clusters, and galaxies! We will be able to see them through the eyepiece and via live images taken through special CCD cameras. So come out for a Minnesota Astronomical Society-hosted night at Eagle Lake Observatory. And don't forget to bring the kids! From Minneapolis: Take Hwy. 62 West to US-212 West to County Road 33 (at Norwood). Turn right (north) onto Country Road 33. Baylor Regional Park will be 2.5 miles up the road on the right. Pay the $5 per vehicle fee at the entrance and once you have entered the park, travel straight up the hill along the gravel road to Eagle Lake Observatory.